THE PANEIDES were twelve young Panes--goat-legged rustic spirits--, sons of the elder Pan. They joined Dionysos in his war against the Indians. "Now [in India] the hill the summit of which is inhabited by the sages is, according to the account of our travellers, of about the same height as the Akropolis (Acropolis) of Athens; and it rises: straight up from the plain, though its natural position equally secures it from attack for the rock surrounds it on all sides. On many parts of this rock you see traces of cloven feet and outlines of beards and of faces, and here and there impressions of backs as of persons who had slipt--and rolled down. For they say that Dionysos, when he was trying to storm the place together with Herakles, ordered the Panes to attack it, thinking that they would be strong enough to take it by assault; but they were thunderstruck by the sages and fell one, one way, and another, another; and the rocks as it were took the print of the various postures in which they fell and failed." "[Rheia summons the rustic spirits to the army Dionysos for his war against the Indians :] The rockdwellers [Panes] came also from their self-vaulted caves, bearing all the name of Pan their father the ranger of the wilderness, all armed to join the host; they have human form, and a shaggy goat's head upon it with horns. Twelve horned Panes there were, with this changeling shape and hornbearing head, who were begotten of the one ancestral Pan their mountainranging father. One they named Kelaineus (Blackie) as his looks bore witness, and one Argennos (Whitey) after his colour; Aigikoros (Goatgluts) was well dubbed, because he glutted himself with goat's-milk which he pressed from nannies udders in the flock. Another masterly Pan was called Eugeneios (Longbeard), from a throat and chin which was a thick meadow of hair. Daphoineus (the Bloody) came along with Omester (Eat-em-raw); Phobos (the Fright-away) with shaggy-legged Philamnos (the Lamb's Friend). Glaukos with Xanthos, Glaukos glaring like the bright sea, with a complexion to match. Xanthos had a mane of hair like a bayard, which gave that name to the horned frequenter of the rocks. Then there was bold Argos with a shock of hair as white as snow . . . Along with these came Phorbas (Fear) to join their march, savage and insatiate." "[During Dionysos' war against the Indians :] The Panes madly made battle skipping with light foot over the peaks. One of them gript and enemy's neck tight with encircling hands, and ript him with his goat's-hooves, tearing through the flank and strong corselet together. Another caught a fugitive Indian and ran him through this middle where he stood, then lifting him on the curved points of his two longbranching antlers, sent him flying high through the airy ways, rolling over himself like a tumbler. Another waved in his hand the strawcutting sickle of sheafbearing Deo [Demeter], and reaped the enemy crops with clawcurved blade, like cornears of conflict, like gavels of the battlefield. There was a revel for Ares, there was harvest-home for Dionysos, when the enemy's heads were cut! He offered the curved blade to watching Bakkhos (Bacchus), dabbled with human dew, and so poured a blood-libation to Dionysos, and made the Moirai (Fates) drunken with the battlecup he filled for them. Another man was standing, when one goatfoot Pan twined both hands interlacing about his neck, and struck his wellcorseted emeny with his horn, tearing his flank with the double point. Another met a fellow rushing on him with a blow from his cudgel, and smashed his forehead right between the ends of his eyebrows." "The Panes [of Dionysos' army], high on their familiar rocks, danced in the dust with nimble feet, passing over the headlands of those untrodden precipices." "They [Panes, Satyroi (Satyrs) and Bakkhantes (Bacchantes)] leapt about dancing on the Indian drags, along the rocky paths; then they built shelters undisturbed in the dark forest, and spent the night among the trees. Some went deerhunting with dogs after the long-antlered stags." 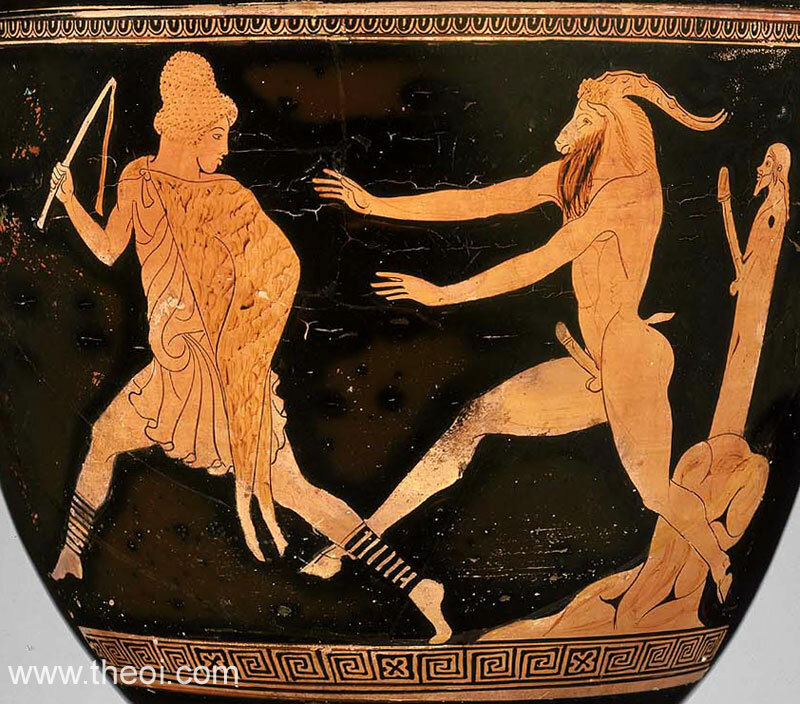 "[During the Indian war of Dionysos :] A friendly Pan fought with his goatsfeet : with a sharp stroke of his pointed hoof he tore all down the hollow flank of [the Indian] archer Melaneus and laid open his belly." "[[During the Indian War of Dionysos, the god is driven mad by Hera, and his army is demoralised :] The Panes had drunk no hot blood fresh from the veins of a lioness of the wilds, and rushed not swift as the wind frenzied into the conflict, but they were mild with fear: hesitating they pawed the ground with gentle noiseless hooves, and ceased the terrible leaps of their highland dance." "[During the Indian War of Dionysos :] When Dionysos saw friendly calm instead of war, early in the morning he sent out mules and their attendant men to bring dry wood from the mountains, that he might burn with fire the dead body of Opheltes. Their leader into the forest of pines was Phaunos [Faunus] who was well practised in the secrets of the lonely thickets which he knew so well, for he had learnt about the highland haunts of Kirke (Circe) his mother. The woodman's ace cut down the trees in long rows. Many an elm was felled by the long edge of the axe, many an oak with leaves waving high struck down with a crash, many a pine lay all along, many a fir stooped its dry needles; as the trees were felled far and wide, little by little the rocks were bared. So many a Hamadryade Nymphe sought another home, and swiftly joined the unfamiliar maids of the brooks. "[During the Indian War of Dionysos :] The people retired into the recesses of the forest, and entered their huts. The rustic Panes housed themselves under shelter in the ravines, for they occupied at evening time the natural caverns of a lioness in the wilds. The Satyroi (Satyrs) dived into a bear's cave, and hollowed their little bed in the rock with sharp finger-nails in place of cutting steel; until the light-brining morning shone, and the brightness of Eos (the Dawn) newly risen showed itself peacefully to both Indians and Satyroi."